Welcome to the Year 3 Class Page! Here you will find important information about our class as well as being able to find out what we have been learning about. Keep checking back to see what we have been up to in Year 3! I can't believe we are entering our final Term in Year 3! We have a very exciting term ahead of us! We will embark on our topic,'Scrumdiddlyumptious!' Keep an eye out for the delicious creations we will be creating and tasting! Swimming is on a Wednesday and PE is on Thursday! Please ensure that both kits are brought in! We held our own General Election to see who would be the new Year 3 Prime Minister, we all wrote manifestos detailing what we would bring to the country! We then elected a candidate from each table who presented their manifestos! After a very close vote the new Prime Minister was... BUPE! Edward Tulane: We have just finished our story, The Miracluous Journey of Edward Tulane! It was about a China rabbit who went on a life-changing adventure! It has been our favourite story this year! We recommend that everyone reads it! Thank you to Father Peter and Margeret who led us on a beautiful journey through the Stations of the Cross! Science Week: This week we had an amazing visitor! Sophie the T-Rex introduced our Science Week! We investigated which rock was the best choice for a dinosaur den? We also made our own dinosaur fossils! THE IRON MAN: We have been enjoying reading, The Iron Man by Ted Hughes! We have created amazing pieces of writing and we are only half way through! What a fantastic World Book Week we had. We enjoyed a trip to Central Library! We also enjoyed Extreme Reading and scavenging. Didn't we look amazing in our costumes? E-Safety Week, during E-Safety week we created posters highlighting how to stay safe online using Comic Life, a fantastic app! Ancient Greece, we have begun our new topic on Ancient Greece. We are so lucky to have Eva in our class, who comes from Greece. 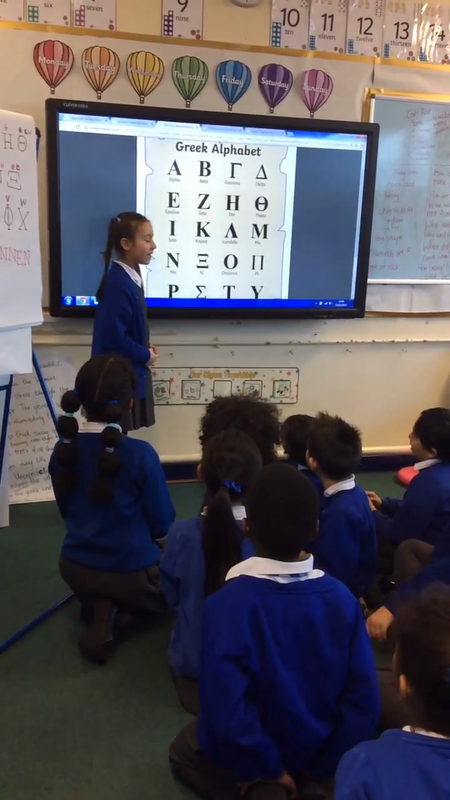 We taught us the correct pronunciation of the Ancient Greek Alphabet. She is a fantastic teacher!!! Science: The features of leaves! In English, we have been studying Gulliver's travels. We are currently exploring Lilliput alongside the colossal Gulliver. We have completed lots of excellent writing. For example, pleas for freedom, diaries and information leaflets. We have also role played as Gulliver begging for his freedom. Lauryn, Daniel and Anessa leading CW! This term we will be learning about The Stone Age, we will be visiting the Calderstones to marvel at the ancient stones. We have lots of questions that we can't wait to investigate this term! Our burning questions about the Stone Age! We have created our own cave paintings, we used charcoal and pastels to create our paintings based on actual cave drawings. We think they look at least 3 million years old! We had a fantastic trip to Calderstones Park. We learnt all about the Neolithic stones, Did you know the stones are 8000 years old? We also got to visit the mansion house and feed some very lively ducks. We can't wait until our next trip!